Used for joining between a male thread and a rubber hose where the hose with the addition of a hose clamp. The nut held captive by a rubber washer is able to swivel independant from the tail making attachment and disconnection easy. Made from solid brass bar or in some larger sizes well finished castings. All our Hosebarbs below are BSP female threads referred to in imperial sizes. 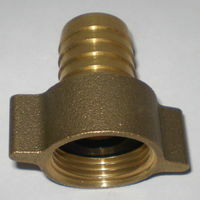 Brass Female Hosebarbs can also be called Hosetails, Threaded Hose Connectors or Hose ends. Suitable for transfer of both liquid and air in low - medium pressure systems. Brass offers strength and excellent corrosion resistance in most standard applications.